As destination weddings continue to surge in popularity, couples are increasingly looking for novel places to get hitched. According to a 2016 study by The Knot, a wedding news and planning website, destination weddings make up roughly 20 percent of all nuptials. Las Vegas, of course, remains a popular spot for saying “I do.” But for a truly one-of-a-kind celebration, skip the Elvis impersonators and slot machines, and say your vows at The Oasis at Death Valley (formerly known as Furnace Creek Resort) instead. Death Valley is a perfect location for anyone willing to trade the glitz and glamour of Las Vegas for the glories of wide-open desert spaces and sparkling, star-filled skies that put the bright lights of The Strip to shame. Just two hours from Vegas, couples and their guests can enjoy a unique wedding experience, says Amber Shields, the resort’s catering and events sales manager. Despite Death Valley’s foreboding reputation, the betrothed and their guests will hardly have to rough it. That’s especially true after a host of recent improvements at the resort. The addition of 11 two-room casitas will let newlyweds spend their honeymoon in style. Savor a lavish dinner and valley views from the inn’s beautifully renovated dining room, an elegant spot both for rehearsal and wedding meals. 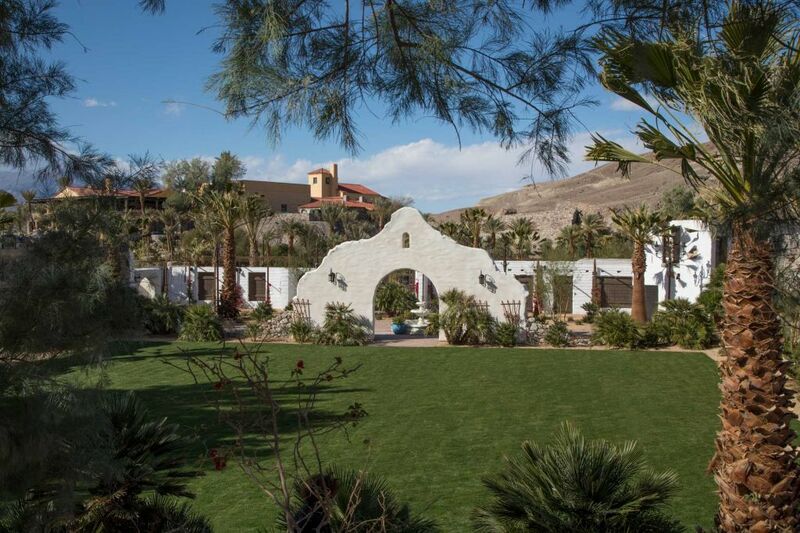 And the Mission Gardens, the new wedding and events venue at the four-diamond The Inn at Death Valley, brings together the romance of Old California and the valley’s natural beauty. Although the Mission Gardens is a brand-new feature at the resort, when you first walk inside it, you may just feel as if you’ve stepped back into California’s past. Because while the garden may not have the centuries-old heritage of the state’s famous missions, it does have an authentic history all its own: The walls you see are not new construction. Instead, after a 1920s adobe building (once the resort’s old laundry facility) burned down in 2014, the surviving walls were saved, then renovated and creatively reimagined to stand as the enclosure for the gardens. The ceremony, of course, is the main event for any wedding, but the entire party will quickly discover that The Oasis at Death Valley makes for a perfect getaway. A new wellness center gives couples the option of easing their pre-wedding jitters with a vigorous workout, followed by a soothing massage. Or for total relaxation, just settle into a cabana by the spring-fed pool. And for any bride or groom who still needs a bit more help chilling out, there’s also a poolside bar. You can also escape into Death Valley’s dramatic landscapes. Go out for a romantic evening carriage ride (just try to do that in Vegas! ), or explore the desert by horseback with Furnace Creek Stables. Then wake up early and head out to Zabriskie Point, where the inspiring sunrise will spectacularly herald the arrival of your wedding day.